After two quiet weeks, waiting for Julia to fully recover from the damn dengue, we left Kupang full of energy en route to Maumere, on the volcanic island of Flores. And we should certainly be filled with energy to board again in a PELNI. This time it was only an18 hours journey but the ship was again crowded. It really is not as bad as it seems, people are very friendly as always but so many hours, in an environment so crowded, makes the experience very tiring. 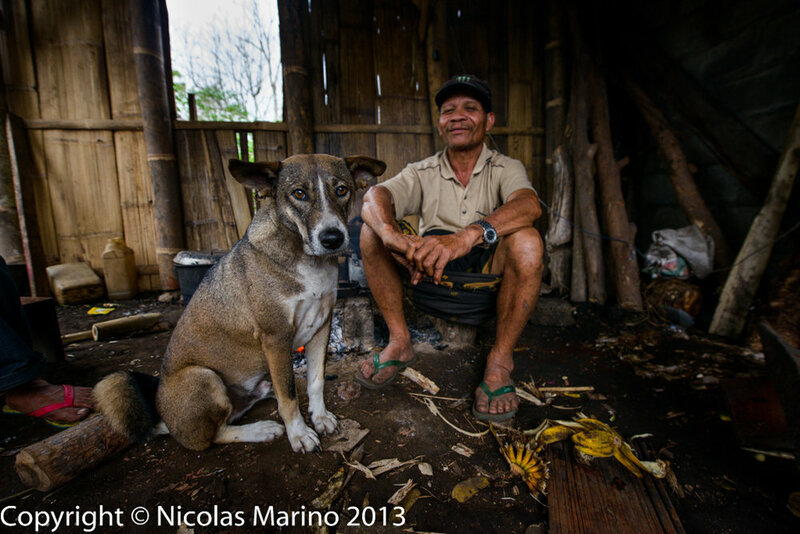 Although the fact of being on the road again, ready to roll in Flores, filled us with enthusiasm. Flores is an island that has almost no flat spots in all directions from edge to edge; all the mountains are covered with green and is hard to find a place, among its intricate geography, without at least one volcano peeking through the clouds. It's a really fascinating scenario. From the port of Maumere and a few miles out of town, we started pedaling uphill without reservation. 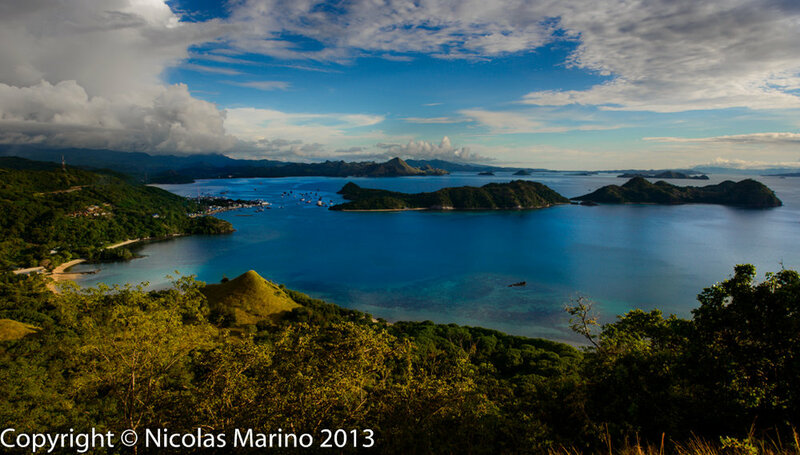 It is the largest city of Flores and yet has a rather large village spirit. Flores's name comes from being a stronghold of Portugal, before they sold it to Holland, who already owned most of the rest of the country. They have inherited the Catholic faith and is one of the few places in Indonesia, the largest Islamic community in the world, where there is almost no mosques. In the first part of the way to Moni, we saw several seminars in the middle of the mountains where priests are educated. Every so often appeared in our path the occasional Western missionary working in rural communities. Once inside the mountains, traditional life emerges everywhere. In villages, women tend to sit for hours in front of the looms. Ikat is the name given to the technique of making the textile lining up colors while maintaining separate threads. We were going up very reasonable slopes, without having to exhaust ourselves to death in them until we reached Moni, a small town that serves as a base to ascend the spectacular crater of Kelimutu volcano. However, we expected something much better than staying in Moni, so we decided to continue the climb to get as close as we could to the crater. We climbed for about 14 km, at times quite steep, right up the hillside of the volcano. The road was passing through some villages and many parts of the slope were sown, it was hard to believe that we were heading to the crater. 4 km before it, park guards forbade us to climb to camp in the crater area and we had to camp there on the edge of the road, at the foot of a steep ravine from which we were above the clouds. We were at about 1500 meters of altitude and the night was quite cold. Rather strange was the sensation of cold feeling in the tropics, it's like you cannot connect experiences so antagonistic. We had to get up at 4 am to climb the last 4 km on foot before dawn, Kelimutu is a triple crater volcano at 1639 meters of altitude, two craters are connected and one is separate in the other side of a slope. Its particularity is that all three have different colors. One is always turquoise, the other shifts from green to yellow and the third shifts from deep black to dark blue. Witnessing the dawn there was a dazzling experience. The dimensions of the main crater are truly scary and walking along the edge of it is chilling, since one false step and… free fall is nonstop until the acid lake that covers the crater. After enjoying the incredible views and the shot of adrenaline of walking along the edge of the crater, we went back down, picked up our stuff and continued towards the city of Ende, located on the south coast of the island. From Kelimutu until there, it was a 40km long descent through spectacular canyons, but 15 km before arriving, when I was in ecstasy enjoying this dramatic landscape, I heard a strange noise between my feet, damn it, loose metal noise, the pedals started to jam every few turns and had to pedal in reverse to unlock them. It didn't take much to realize that the bottom bracket had collapsed and the bearings were jumping wildly into the already broken piece. At that time I burst in frustration, hatred and anger. In one of the most amazing islands of Indonesia, but also one of the most precarious, I had been left, virtually, with no bike. On the whole island there is not a single bicycle shop, since long time ago, all people here renounced the blood driven means of transport to replace them with cheap and loud scooters. I got to Ende rolling to eke, praying to destiny to find a store there. I wasn't asking for quality stuff, any shop that would have some cheap Chinese spare parts would suffice, I just needed something that would allow me to keep riding, so we looked and looked but to no avail. It could not have been a worse place for something to break and it was hard to overcome the frustration and the bitterness. The next day, after leaving Ende, I decided to continue, trying to go slow, as long as the pedals kept rotating, but it was a torture, every few turns of the pedal forward, I should do much more backwards so that the bearings unlock. It was an exhausting exercise, but I didn't give up to having to put the bike on a truck. I was able to manage 20 km along the coast out of Ende, an incredible road where volcanoes get plunge right into the ocean and beaches are of an utterly beautiful, thin and glistening black sand. The grace period did not last much, the slopes were back and it was impossible to maintain the back and forth routine, not only that, but at one point the pedals had finally got stuck completely. There was not any other chance than waiting for any truck to stop and take us to our next destination, Bajawa, about 80km away, high up in the mountains. Three very gentle men who were headed there picked us up. It is difficult to explain the frustration. Going with the bike on the box of a truck and looking at the scenery at the speed of a vehicle, at this point I find it truly unbearable. The paradoxes of life. When I did my transition from backpacker to bike traveler I remember spending most of my time trying to assimilate the slowness of the bicycle. During those days, I would not reach my destination overnight anymore but it would take me several days of effort and loneliness. Accepting that, and learning to live at a slower pace, was very hard for me in the beginning. Today, 7 years later, the speed of the motor transport is intolerable to me, I feel that I'm literally missing everything of the place in which I am travelling, that I'm not in control of my pace anymore. I want to go slow, stopping in every town, village, city, to chat with the people in a restaurant or a little kiosk or wherever I am, I want to stop when I want to smell a flower, get my feet wet in a stream, breathe the perfume of the vegetation around me. Arrrgghh I felt so damn frustrated and bitter! watching all these landscapes, making these climbs and passing through the villages at 80 km/h! I CAN'T TRULY SEE ANYTHING, I CAN'T REALLY FEEL ANYTHING! Luckily, Kelvin, his brother and his father-in-law, who lived in a village on the outskirts of Bajawa, invited us to spend our stay in their home. The Indonesians rarely live alone. Outside the big cities, it is almost non-existent. They all live with their own family and one or more relatives, close or not, and many times, with friends as well. They have a strong sense of union, not only by affection but also clearly by economic necessity: they support and protect each other. In the house of Kelvin's family, I think that at least 15 people live and pass by during the day and night. It is a very traditional village, where people do all the tasks by hand and there is no floor that is not soil. Bajawa, at 1100 meters of altitude, is a place that can be very cold during the nights or when raining. At the back of Kelvin's House, we used to sit together around the fire to keep ourselves warm, talk about life and, above all, drink coffee. Coffee grows everywhere in Indonesia, each island has its own type of coffee because almost everyone has the trees behind their homes. They drink it as if it were water, and rightly so because it is simply delicious. It becomes completely addictive. I believe that I never drank so much coffee in my life and now I'm totally sure that it is one of the things that I'll miss the most when leaving this country. Spending two days with Kelvin and his family in their village helped to somewhat mitigate the frustration that I had because of my broken bike. The day that we left the village, Kelvin took us a few kilometers until reaching the junction to Aimere, from there I could roll downhill all the way, from 1100 meters high, 40 km down to the coast without having to push the pedals. I happily rolled all the way down, enjoying the ride, making up for the 350 km that I had "lost". The descent to the fishing village of Aimere was a gradual descent along a road whose form I can only compare to an intestine, the amount of bends turning 180 degrees was unimaginable. All the descent was accompanied by breathtaking views of the Inerie volcano, with its perfect triangular shape coming out of an intricate mountainous landscape, with one of its slopes falling straight into the ocean. The volcano was mostly elusive, hiding and uncovering, as we were moving. Once in Aimere I walked about 10 km further, with Julia rolling slowly ahead of me until the beginning of the new climb where we had to wait once again for some other pickup truck. We waited a long time until a man who was with his wife and his daughter picked us up. He took us to Ruteng on a road mainly going uphill. We had the most amazing views of the Inerie during this ride, and it was such a fast ride that I was bursting in frustration again, I felt like jumping out of the truck! This quick damned pace that would not let me enjoy anything. Everything was happening so fast! How can the world be truly experienced in this way? How did I do during my ten years of backpacking? Did I really feel any thing at all during those years? This feeling of speed was unbearable to me, the inability to feel the world at the magically slow pace of the bike. 70 km more lost and we arrived at Ruteng, where we were once again surrounded by lush mountains and volcanoes everywhere, rice plantations and a delicious fresh climate due the altitude, although not as cold as Bajawa. For the next day, I had the same plan from the previous day: to continue cycling downhill as far as I could, I just wish it would have been so simple though. This time it wasn't simply a straight road downhill like the day before but there were climbs as well. Even so, I was not willing to give up quickly and get into a damned vehicle, so with Julia slowly going forward, I decided to keep walking until my feet burst with blisters. I spent the rest of the day cycling when there was a way down and pushing when it was either flat or uphill. I climbed and climbed and climbed pushing the bike. It was exhausting and very slow, but at least I could feel! I was happy, it wasn't ideal but by walking I was able to get some feel back! It could be done. From Ruteng to the final big climb before Labuanbajo I walked approximately 140 km in 2 days and even though they were very slow, hard and sweated my life away, I enjoyed every single second of it, almost with euphoria...well, not every single one. I never believed that I was going to say this, but the children of the mountain villages of Flores were worse than mosquitoes. It is bad to say this, I know, especially when the children are usually adorable, but in this particular stretch, as soon as I entered their range of vision in the villages, they came in groups of 20-30, surrounded me and kept bugging me non-stop. Responding to the "Hello Mr." was useless, a response was not enough, they wanted 50 and remained around me like a plague and they would not go away, they just were there bothering. It was not a product of my bad mood, I swear it, children are generally what I like the most wherever I go. Julia, who could move faster with the bike, felt the same and had to cycle faster because they drove her crazy, on the other hand, I, who had to walk next to my bike, had them pasted as leeches for several kilometers. Some climbs were really long but at least, I had control of my own pace and didn't have to leave it to the engine of a vehicle. In the villages we recovered our strength with the coffee that people would invite us in their houses made of bamboo lattices. When I was walking, exhausted, they looked at me with pity, but I smiled back at them and told them that everything was fine, that my bike was just broken. After almost these unusual 150 km, combining rolling down and pushing the bike the rest of the time, left me with very sore feet and full of blisters, because, as if it hadn't been enough, I didn't put on my shoes, I did everything wearing one-dollar flip-flops (slippers). We arrived to the last great, 15 km long climb and finally gave up, but by then I was mostly satisfied. With my reluctance (and stubbornness) to surrender such a wonderful island to the roar of the engines, I had succeeded in reducing just to 1/3 the part made in pickup trucks. It was very hard, I ain't gonna lie, at times boring, but at least I felt the way I use to feel. Julia, on the other hand, was able to cycle slower than ever without even having to accelerate her heart rate while moving forward and taking long rests while waiting for me. This way, we finally got to Labuanbajo, a quiet fishing village (although on its irreversible way to become very famous) where the geography of Flores dissolves in a series of paradise islands of whimsical shapes, scattered in the ocean. Here, we only had to relax and enjoy doing nothing but swimming in crystal clear waters and contemplate dreamy sunsets while we waited for the Bukit Tilongkabila, to start the last trip we would have to endure on board of a PELNI in Indonesia. The ferry would take us to the very first port from where I could get to a decent bike shop in which to finally fix my bicycle. 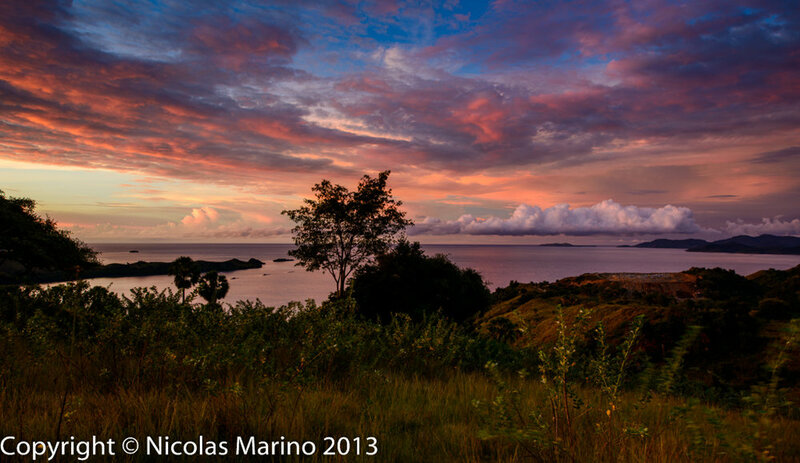 Here is a series of color changes of the affable Labuanbajo skies.